I haven’t written much lately. I can’t remember much of what’s happened lately. I know yesterday the kids and I biked to downtown Albany (about 10 miles, round trip) for some kind of weird pirate fair they were having. Had lunch there, watched an eating contest, bought some pirate flags, stopped at the park for awhile. 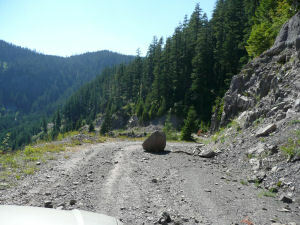 A couple weekends ago Sheila and I went to Detroit Lake and afterwards drove up a mountain to find some hiking trail. 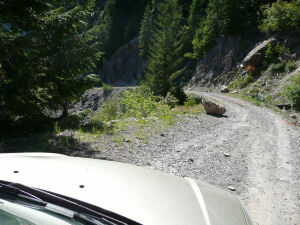 The narrow road was covered with boulders and there was a giant cliff on one side. 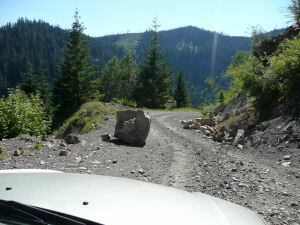 We kept having to edge around the boulders, sometimes scraping the car on them. I was just waiting to have one fall on us or for us to fall off the edge. 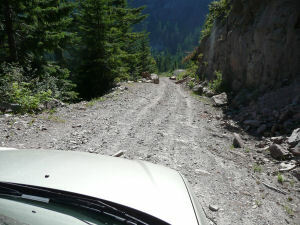 We passed some people on the way up who were stopped and told us that the road didn’t look good for driving so they were going back. Yesterday Kylar’s dad stopped by because he wanted to ensure that we hadn’t accidentally kept some Xbox 360 games we’d borrowed from him. I told him sure, come on in and we’ll check. The weird thing is, Kylar doesn’t visit us anymore and we’ve never borrowed games from him. The kids all just play Halo 3 together all day instead of actually visiting each other in person. So we take a look at our games and, as expected, none of Kylar’s games are there. Then he pulls out the big guns… “Well, we looked at your online high score list (whatever it’s called) and noticed that you’ve been playing the games that we’re missing.” “Oh yeah? Which games are those?” “Well there’s Bioshock.” I remember Bioshock – it’s the first game we ever rented on the 360. He tells me that Civilization Revolution is on our online list. I’ve never even heard of this game. Emily looks and finds Dance Dance Revolution on the list. “Is this the one?” “Oh yeah, I guess it is.” It was so lame. I was nice about it, though. But he still didn’t give me a friendly, “Oh sorry about coming over here with my lame detective skills and accusing you and your family of stealing our games” on the way out. 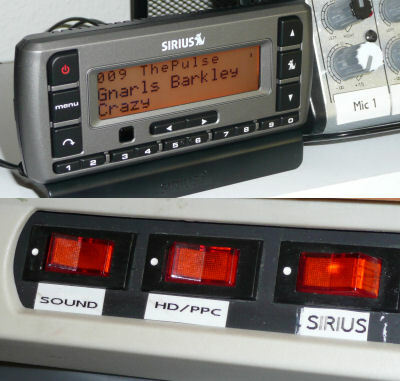 I bought a cheap Sirius radio yesterday in an attempt to keep up with The Spessas. She was bragging to me about her new Sirius radio so I just had to run out and show her how frivolous I can be. I’m still not sure I’m going to keep it. It’s about $12/month and I’ll mostly be using it in my room. Seems like Yahoo Music might accomplish the same thing for $25/year. But I’ve been enjoying Sirius so far – it’s been playing nonstop for 24 hours now. Jammie, who rules, sent me a video of the PLA HOPE thing. I cut it down to about 10 minutes this weekend and put it on YouTube. Here it is. I mainly just kept the parts in that got the most applause and laughter to make us seem extra cool. Yeah, well Bruce’s wallet went missing the night you guys visited. I KNEW you took it. Didn’t you! Admit it! Now! No, John accidentally swapped wallets with Bruce. The dork. Hah, accidentally. That’s just what I WANT you to think. I hear Jammie was also ruled….in bed.